Though my Jinn ancestry means magic has always been inside me, the rules don't allow me to begin drawing upon it until the day I turn sixteen. The day I receive my silver bangle. The day I officially become a genie. I'm almost out the door when I turn back around. My mother's right. This is a long road. Maybe I can dislike what I have to do without disliking who I am. The gratitude in Henry's smile guts me. To him, I'm the girl from across the street, the best friend of the sister he lost, and the genie who helped the sister he clings to and puts before everything, including himself. The fact that Genie's (Jinn) are a mythology had never really crossed my mind. This being said, I could not tell you of ever hearing about a book on Jinn prior to now. Weird to think that something that has been considered a myth for so long was never picked up before now. I mean who hasn't wished for a Jinn and three wishes. But despite everyone wanting that, I can't imagine many considering the background that comes with it. Some may call it paranormal or put it with the mythology like vampires, but what makes Jinn fit into the mythology for me is how uncommon it is. Jinn have yet to sparkle and avoid certain weather (cold not included). I like vampires but the Jinn have an originality like no other. Goldstein crafted a completely unique world, within the world that we already know so well. She made this story rich with a magic and Jinn culture. I really appreciated this about a third of a way through the book. This being said, I did find that it was a bit of a slow start. There wasn't really a struggle because I was interested, but it may be a factor for some people struggling when picking this one up. There are also things that I questioned, but these are the things that were often questions in the book as well. It's hard to weigh in on something like plot and pacing when I was pleased in the long run, but pulled hard at the start. Azra... Where to start with her. She is a character that leaves me conflicted. I can't say that I ever connected with her but I can say that once I got past a few things that I enjoyed her. Azra hates her position and basically her future; this is where it gets complicated. I can't blame this teenage girl for wanting out of the future that she has no say in, but at the same time it is her heritage and I found her reasoning was often shallow. However, I understand her irritation with rules that just don't seem to make sense or have no backing to them. Azra lives in a world where you do as you say and don't question it. Doing so may cause problems for not only you but those around you. I'm not sure if there really was a romance or not. I felt at times that there was an undertone of romance and at others it felt like a triangle was forming. I know this sounds odd but the romance didn't detour me, nor interest me. For me Henry deserved more credit but walked on very thin ice for the circumstances, and I was never really sure of Nate. Nate is the character that I really want to like but don't know enough about to decide if he's genuine or something more is going on. Henry however adds the element of something to lose and creates a bond between the worlds. Becoming Jinn was a start of something that could be great. There was a lot of building in both the plot and the majority of the characters, that has a lot of potential. Goldstein created a fascinating start that I can see twisting into something fantastic. Seeing I am new to the Jinn world I am not really sure who I should recommend this too. If you are looking for something that you can relax into and look forward to the next book and its progression. This book despite its downs was something that I enjoyed and can be excited about book 2. Another HUGE thanks to Raincoast Books for this donation!! 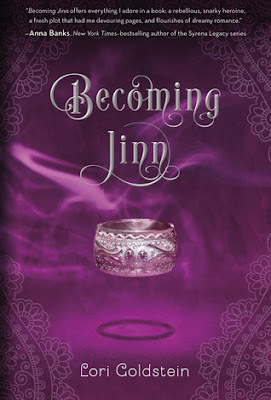 I will be sending 1 lucky US/CAN winner a HB copy of Becoming Jinn!